G'day Abites. How ya' goin'? That's Aussie for hi, how are you. I think I've mentioned before that I haven't read much in the way of classic literature. As a kid I thought, if they made you read it in school it must be boring. Sometimes when I've read classics as an adult I decide I was right as a kid, and sometimes not. 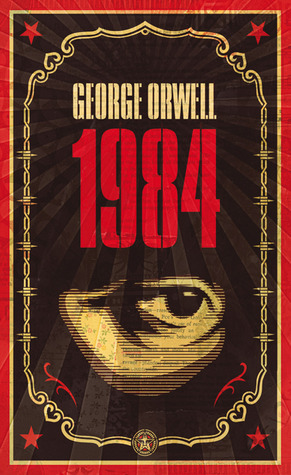 1984 is one of those books that many high schools have on their curriculum, but it is one I wasn't forced to read, so I didn't. Until now. In the beginning I empathized with Winston, but not for long. I didn't feel the love Winston had for Julia, even though we were told he felt it. But then again this book was written in 1948 and I often have trouble with the way love stories were written in the classics. I could, however, feel his fear, his hopelessness, and his sense of being trapped. In many ways this book does deserve to BE a classic. It was way ahead of it's time in some regards, especially the way it describes Big Brother and technology. Although written in 1948, it is set in London in 1984 at a time when there are only three mega-countries left, and war is continuous (although who you are warring with changes). How chilling is that? Especially Ignorance is Strength. That is terrifyingly true. If you keep people ignorant YOU have all the power, and power is a key element in this story. As for the technology, they have telescreens (I'm guessing they would look a lot like today's flat screen TVs) everywhere, but in Oceana you aren't just watching the screens, they are watching you back, monitoring your every move, every word, and every sound you make. Even the expression on your face. Pretty alarming, right? And worse yet, you can be convicted of a thought crime. You don't even have to have done anything, except think. Poverty is rampant and deliberate. Children are taught to turn on their parents. Hate is a requirement to live. The past is constantly changing. And in the blink of an eye, your very existence can be erased. In light of the technology of today, and the NSA, FBI, and CIA surveillance of the internet and telephone usage of Americans (yes, other countries do this to I'm sure, you just don't hear about it as much) some of Orwell's imagined future is spot on, which is why much of his terminology is common usage today, especially the term Big Brother, and why "Orwellian" has come to describe a state in which governments have too much control. I didn't love this book. Parts of it I hated. But I do think that it is a cautionary tale, and should be mandatory reading for just about every person in the world over the age of sixteen. 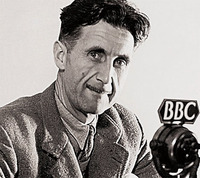 We can't let Orwell's imagined future become reality. We are already half way there and we are far too complacent about it. Don't let Big Brother win. Do you worry about Big Brother? How close to you think we have come to Orwell's 1984 becoming reality? What do you think we can do to stop it? Ninteen Eighty-Four is George Orwell's terrifying vision of a totalitarian future in which everything and everyone is slave to a tyrannical regime. Remember the post that Geoff wrote about Dystopia a while back (D is for Dystopia? )"Dystopian novels warned us of dark futures born of willful ignorance, of what we sacrificed for sake of convenience or safety, and now they ironically, or perhaps even as tragical poetry, have been turned into a vehicle for vapid fluff. Setting and spectacle are what is delivered, a slightly altered location, a small twist in the monsters presented. Perhaps that is their ultimate evolution and the conclusion of their jagged point, that they can be de-fanged, all potency removed, deep meaning evaporated. Destroyed, not by burning, but by acceptance." I love TRUE dystopic writing. Orewell is amazing, and people label things dystopic these days like they label things paranormal and throw vampires in them that sparkle instead of ripping your throat out. You are not suppose to walk away from this book feeling good. In fact, I think you nailed this book. Well I didn't walk away feeling good, so I must have done it right. ;) Thanks Kriss. Now do you see the difference between this and Hunger Games? Or something similar? There was nothing, including his writing style, that was not done intentionally. Read Animal Farm next. Maybe we all should read it next. It is more an allegory and less dystopic. It is directly allegorical and directed at the political climate at the time. I've not read it yet. Yet. Do you plan to Jess?